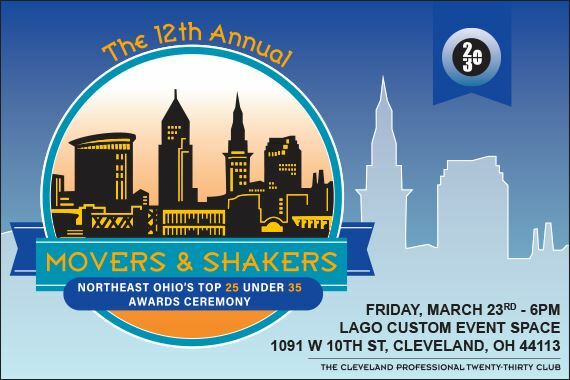 Join us for the 12th Annual Movers & Shakers awards ceremony where you can mingle with Cleveland's rising stars and network with the city's current "Movers and Shakers." The awards celebrate 25 individuals under the age of 35 for excellence in their work, civic engagement, academia, and/or philanthropic efforts. We will begin the evening with hors d'oeuvres and cocktails prior to the formal program. Our guests will enjoy a dynamic keynote address from Dan Moulthrop, CEO of The City Club of Cleveland, presentation of the winners, and end the evening networking with Northeast Ohio's Movers & Shakers! **All attendees will receive 1 complimentary drink ticket. Cash bar available. Dress for this event is Business Casual / Business Professional. Join us at the Lago East Bank bar for the after party!